Trauma-Informed Care changes the basic paradigm from asking "What is wrong with you?" to "What happened to you?" Notice how changing the basic question radically changes the way we perceive of the person and what they are experiencing and doing. Changing the basic questions is at the heart of the Appreciative Way. I would say that problems exist because we are asking the wrong questions. To often we ask; "What is wrong? or its more shaming version: "What is wrong with you?" and exacerbate the situation by evoking shame and blame rather than bringing creative solutions to the situation. But changing the questions may not be enough. What we need to do is change the underlying paradigm that is prompting the question. Notice the problem that can arise in Trauma-Informed Care approach if the underlying paradigm of blame is still in place. "What happened to you?" now becomes the pursuit of external sources of blame for the person's problems rather than a foundation for pursuing solutions. Shifting blame is not the pathway to health and passionate living. In many ways religion and psychology are very similar in that they share a foundation of seeking causality (blame) for humanity's problems. Religion gives us catalogs of sins (see Leviticus as an example). Psychiatry and Psychology give us catalogs of neurosis and more recently mental disorders as in the Diagnostic and Statistical Manual of Mental Disorders which is getting ever larger and more precise in describing the subtle difference in the varieties of human misery. Diagnosis is just a sophisticated word for judgment and blame which in turn leads to alienation. Knowing what is to blame for what is wrong may make the expert feel intelligent but it doesn't help the sufferer. Too often eloquent descriptions of problems masquerade as solutions and do little to bring healing. All the experts feel good about their insights and still the sufferer suffers. St. Paul also challenges the idea that the law (catalogs of sins or mental disorders) can heal or bring life, in fact they just bring death. We need to change the basic paradigm of blame to one of grace. 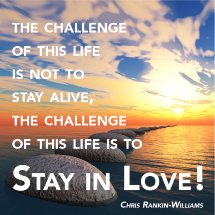 We need to move from helping people have less death (problems) to living abundantly. * How did you survive? * For what life-giving purpose did you survive? The first question moves the person from being a victim to being a survivor. Sadly many traumatized people never realize that they survived and they continue to live out a succession of victim experiences. But simply surviving is not enough as it quickly becomes a journey of toil and endurance. The third question begins to move the person from a survivor to a thriver. To thrive we need to live from a place that is life-giving. From a place, that while it may be very different from before the trauma, is still a place of love and life. Christopher Reeve is one of my thriving heroes. Despite the profoundness of his injuries he went on to live an inspirational life. 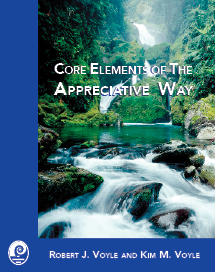 The Appreciative Way offers a systematic approach to living beyond the paradigm of cause and blame and living in a life of grace. It is not simply a theory but a set of strategies that enables the core values of the Christian life such as love, grace, and abundance a reality. If you would like to learn these strategies or apply them to the task of helping people through transitions then I invite you to participate in one of our upcoming training programs. Check the Training Schedule for the latest listing of coach training programs.